"Interactive Audio" is audio for interactive media such as video games, AR/VR environments, and websites... anywhere the audio changes according to listener input. The term "Interactive" is used to distinguish it from "linear" forms of audio (such as in films and in cut scenes in games) where the audio is decided in advance and always is the same no matter who is listening. The creation and delivery of Interactive Audio involves specialized skills and tools, and the close cooperation of composers, musicians, sound designers, programmers, educators, and software/hardware developers. The IASIG is an organization that brings together experts to share their knowledge and help improve the state of the art in audio for games, websites, VR content, and other interactive performances. Our members share tips and techniques, study trends, and create reports and recommendations that game developers, tool makers, and platform owners use to create better products. Browse our site to see what topics IASIG members have discussed in the past, what recommendations they have made, and what they are discussing now. Registration is free (and required to view IASIG publications). Want to help out? Anyone with a commercial interest in audio for interactive entertainment is encouraged to Join the IASIG to participate in discussions and contribute to IASIG recommendations. IASIG's "IASIG Physical Modeling Plugin Working Group" is now signing up members. Technologies for Immersing Listeners in 3D Space. 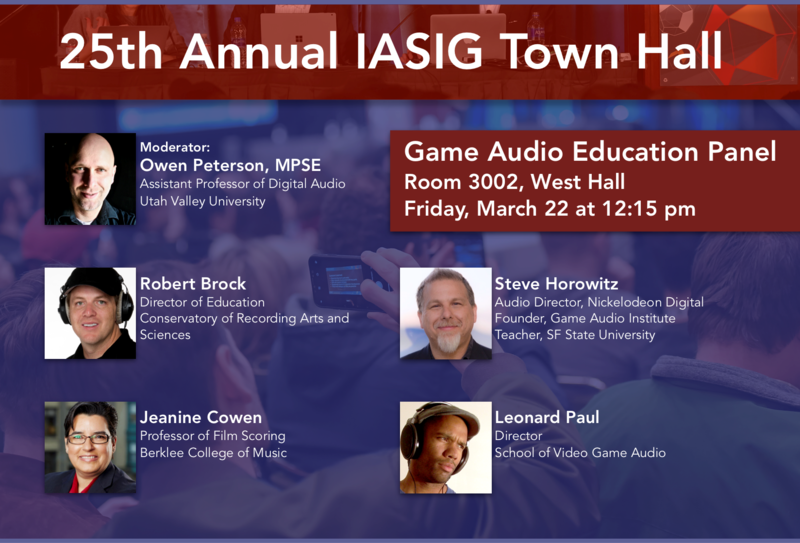 coming to San Francisco, March 18-22.
and the IASIG Audio Mixer. Click here for more info.